American World War II war aces don't get enough credit. There are good reasons for that: American pilots didn't have as much time to rack up huge scores as RAF and Luftwaffe pilots, the opposition was lighter by the time the Americans arrived in force and there simply weren't many targets, and so on. A tour would last a year and then you would be back Stateside, whereas pilots on the other side had many years to rack up experience and phenomenal totals. 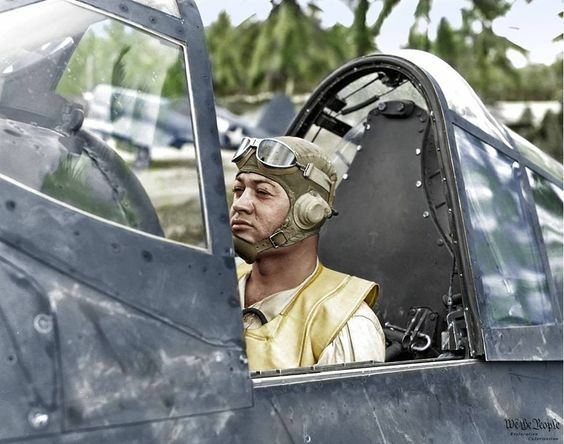 However, despite this competitive handicap, a few pilots stand out as much for their personal tale as for their incredible achievements in the air, and one of these is Gregory "Pappy" Boyington. Gregory Boyington was born in Coeur d'Alene, Idaho on 4 December 1912. He took his first flight at an extremely young age for the era, six years old, when he went up with Clyde Pangborn. He later attended the University of Washington in Seattle, where he was in the ROTC. 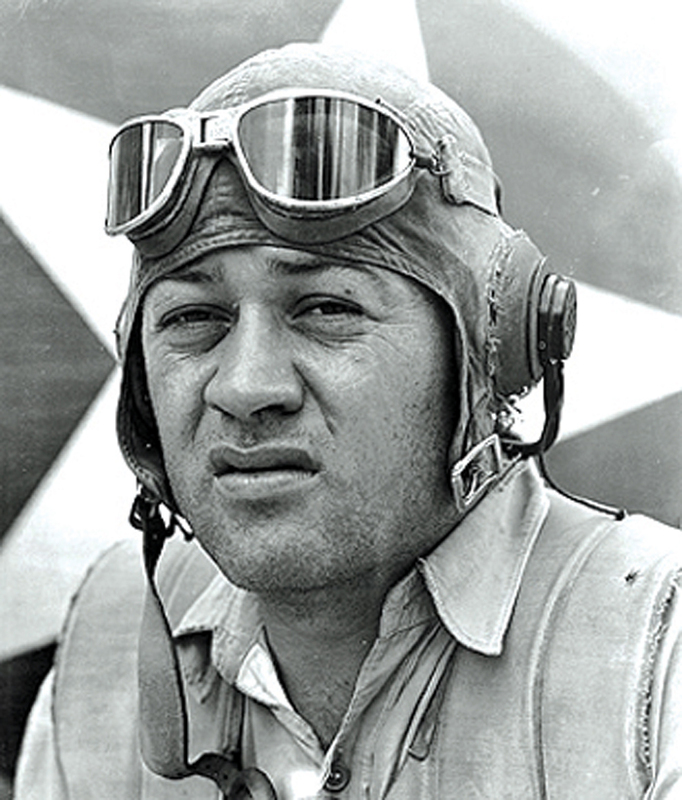 His love of aviation kindled by that early flight, Boyington graduated in 1934 with a degree in aeronautical engineering. He soon found an office job at local employer Boeing and got married. Using an unusual workaround - he found out that his real father was not his supposed dad and thus assumed his real father's last name - Boyington evaded restrictions against married men being trained to fly under the Aviation Cadet Act. He eventually wound up as a 2nd Lt. in the Marine Corps and became an instructor at Pensacola. 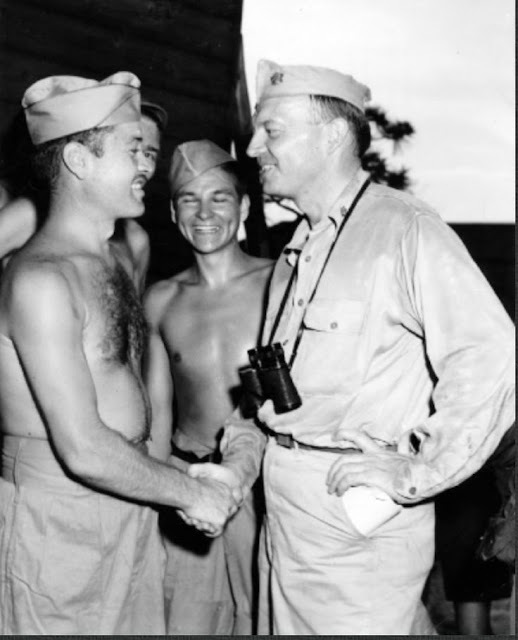 Pappy did not particularly enjoy teaching, and when an opportunity arose to join the Flying Tigers in China, he leaped at it and resigned his commission. Technically, he became a civilian employee of a front company called the Central Aircraft Manufacturing Company (CAMCO), but in reality, he was a fighter pilot for the American Volunteer Group (AVG) in a full-blown shooting war (while the rest of the US was at peace). Soon a flight leader, Boyington began showing a rebellious streak that never left him, clashing with his superior Claire Chennault. He claimed six victories over the Japanese during his year and a half with CAMCO, finally leaving in April 1942, though records from the time credit him with two air kills and around two on the ground (various records differ, officially he is granted six victories with the AVG). 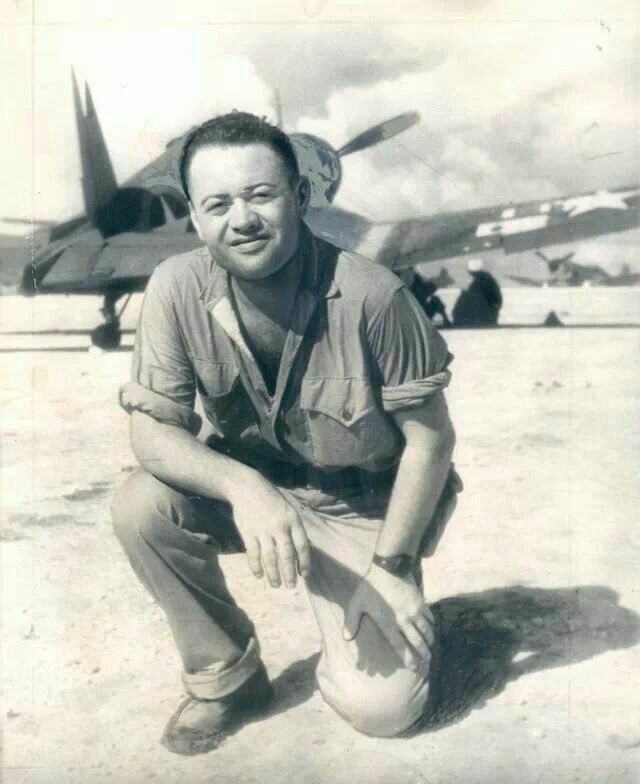 It was 1942, the United States finally was in a hot war and needed every pilot available, and Pappy Boyington - perhaps the most experienced fighter pilots in the US - spent the summer parking cars for a living. It was an incongruous situation that finally resolved itself after his application to rejoin the Marine Corps was granted on 29 September 1942. Not only was his application granted, but he was promoted to Major. 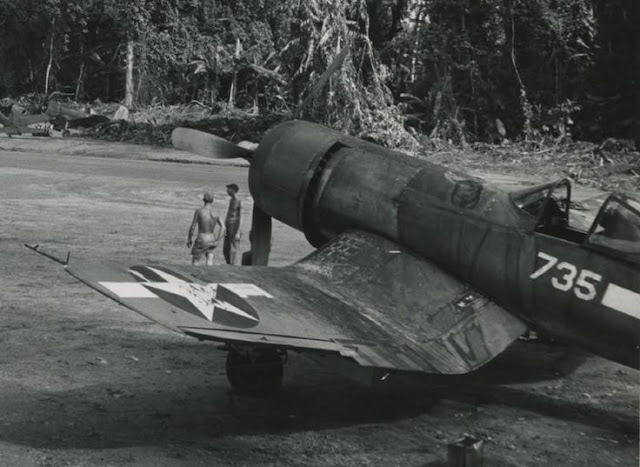 He took command as Executive Officer of Marine Fighter Squadron 122 on Guadalcanal in early 1943, just as the Japanese were leaving the island. However, experienced Japanese forces remained based just to the north, and constant battles erupted over the "Slot," the narrow north-south shipping passage north of Guadalcanal that is formed by the Solomon Islands. 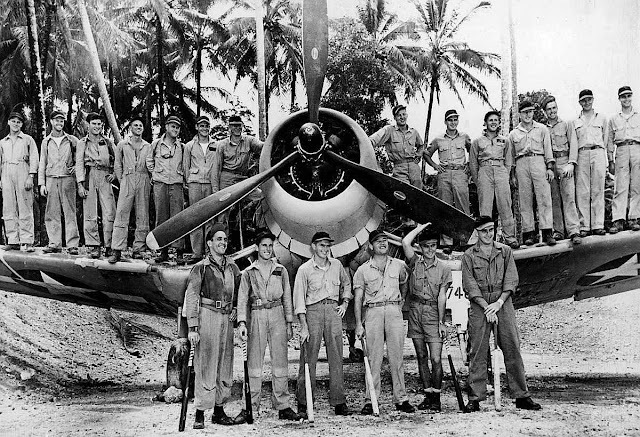 Later that year, Boyington became CO of Marine Fighter Squadron 214, the one that became immortalized due to his leadership as the "Black Sheep Squadron." 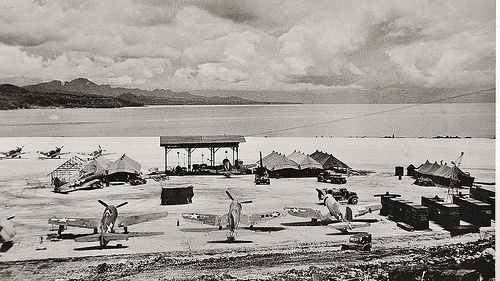 Boyington had a flair for combat, and his base eventually moved north to Vella Lavella as the Japanese gave ground. His pilots took to Pappy's irreverent free-wheeling style and engaged in numerous publicity stunts, such as offering to down a Japanese Zero fighter for every major league baseball cap sent by a major league player in that year's World Series. The unit was known as indifferent to authority, but it was the most successful in the theater and the backbone of the advance up the Slot and thus largely immune to criticism. Vella Lavella airstrip, home of Pappy's squadron, used 1943/1944 and thereafter abandoned to the sun and the wind. Pappy, flying the famous Chance Vought F4U Corsair characterized by its gull wings, began racking up a phenomenal total of kills. Pappy's tour was about to end after a year in early 1944 (against his wishes), and he was unlikely to be granted another. He went up for one more major sweep over Rabaul on 3 January 1944 when he easily could have stayed on the ground. 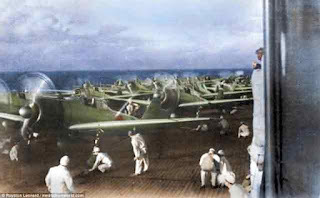 This time, the Japanese were waiting with a massive force of 70 fighters against the 30 of the attackers. Unknown Japanese pilots (though one later attempted to take credit) shot down both Pappy and his wingman. Pappy wound up in the drink. Chance-Vought F4U-1 of the famous VMF-214 Blacksheep squadron. At the time of his downing, Pappy Boyington was a leading air ace for the United States, credited officially with 28 aerial victories and six with the Flying Tigers. 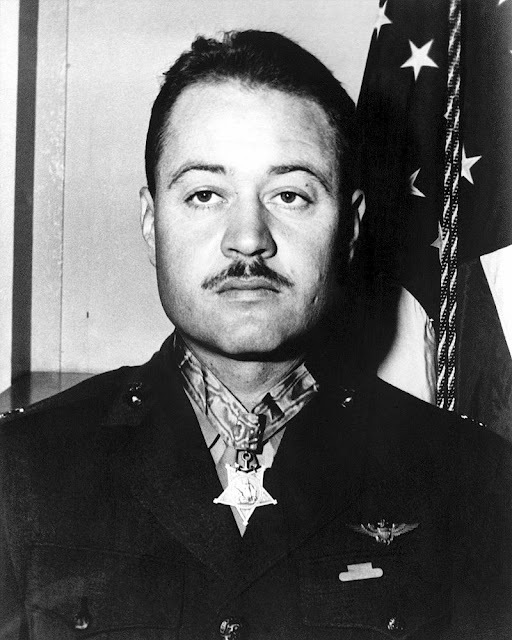 He is tied for 4th on the list of US air aces during the conflict along with Gabby Gabreski and was the top US Marine Corps ace. His victories were against the best that the Japanese had to offer, and turned the vaunted Zero from an object of fear to just another opponent. Pappy Boyington with his squadron in 1944. Pappy spent the remainder of the war in a POW camp after being (luckily) picked up by a Japanese submarine. For completely specious reasons the Japanese never reported his presence to the Red Cross or anyone else, and nobody knew what had happened to him. Pappy Boyington's autobiography, "Baa Baa Black Sheep," recounts in detail the starvation that he and others endured at the camp, though he eventually found work in the prison kitchen and stole enough food to survive and even put on a little weight. Pappy Boyington greeted by Harold Stassen upon his release from prison camp. Pappy noticed the increasing Allied fighter presence over the camp as time dragged on, and witnessed the atomic bomb blasts, which were noticeable by their intense flash at his prison camp in Ōmori Prison Camp near Tokyo. He realized that the war was almost over when the brutal prison camp guards suddenly became more courteous. 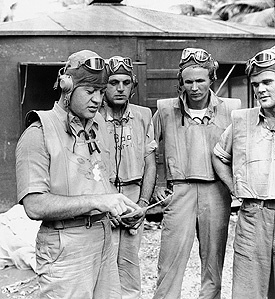 After his surprise return to the United States in September, Boyington received the highest military decoration, the Medal of Honor, as well as the Navy Cross. He retired as a Colonel in the Marine Corps in August 1947. 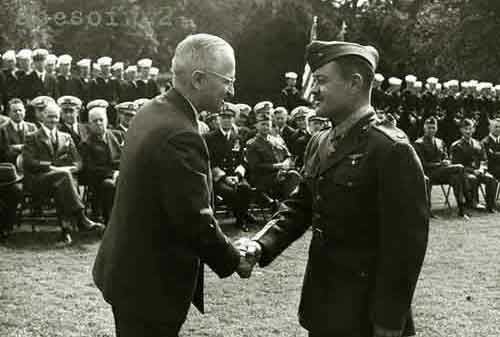 President Truman awards Pappy Boyington with the Medal of Honor. "You came here to be entertained by some sideshow freak, I know. You want to hear about the time when my foot was bleeding so badly that I had to roll my Corsair onto its back to make my blood last longer. How I continued shooting down Japs upside-down against overwhelming odds. Yes, you'd love to have me dramatize the race between running out of ammunition and running out of life's blood. But I know the only reason I should be here tonight. And I would like to inform you of the only reason you should be here. It is not to pay homage to a so-called war hero, because he would have been helpless without the financial assistance of slobs like you. So, in closing, I'm going to remind all of you slobs to continue to invest in War Bonds. The speech, while honest, truthful and even a bit clever to dispassionate modern eyes, was a fiasco for the conservative event and times. It forced Pappy to come to terms with his drinking problem and ultimately solve it. Boyington turned to various other occupations over the years, including refereeing professional wrestling. 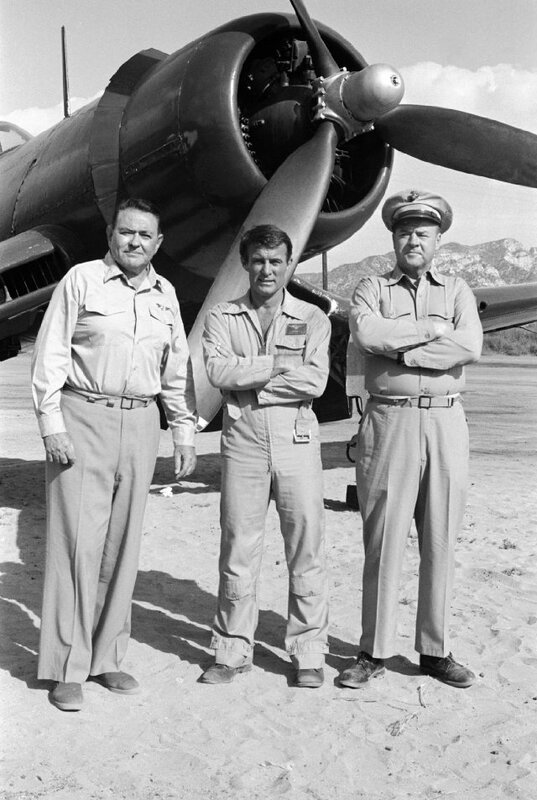 Simon Oakland, Robert Conrad and Dana Elcar on the "Black Sheep" set. 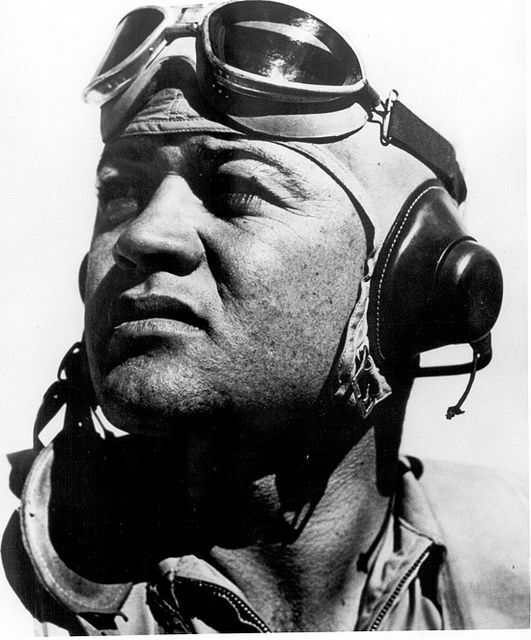 I can't be the only one who noticed the remarkable resemblance between Simon Oakland and the real Pappy Boyington. 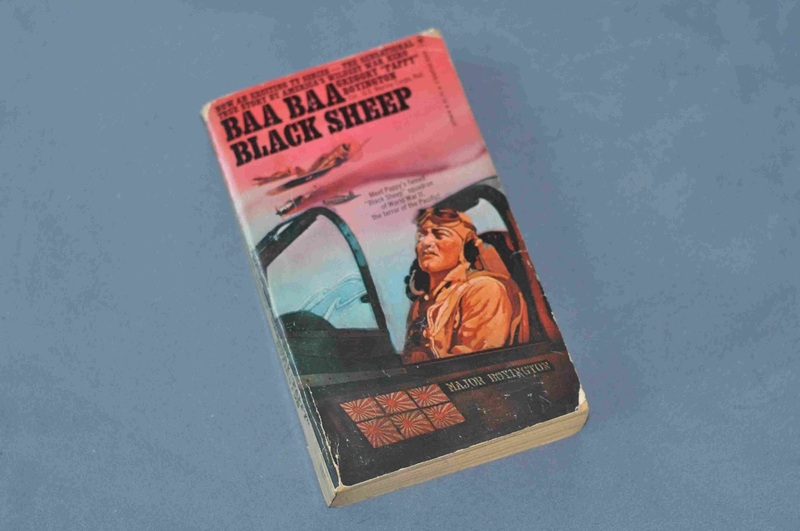 Much later, Boyington advised on a television series about his wartime experiences, "Baa Baa Black Sheep/Black Sheep Squadron," in the mid-'70s (which he admitted was mostly pure fiction). While William Conrad played Pappy in the series, the actor who played the CO of the island, Simon Oakland, was the spitting image of Pappy. His fame buoyed by the series, the real Boyington was a regular at autograph conventions throughout the northwest until his passing in early 1988. 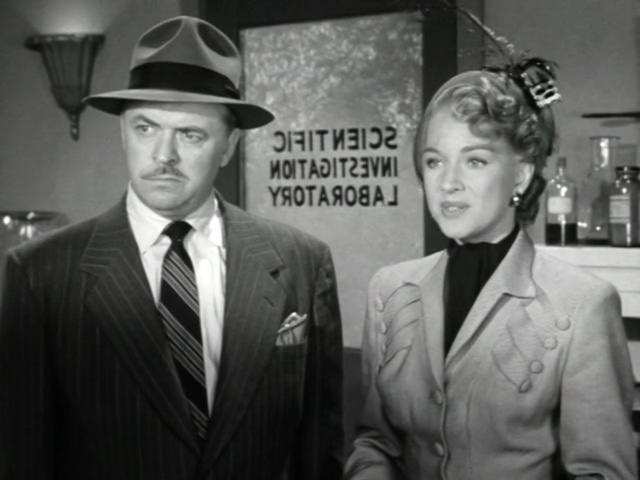 Dee Tatum, right, with Lyle Talbot in Robert Lippert's "Mask of the Dragon" (1951). Purely coincidentally, Talbot in this role bore an uncanny resemblance to Pappy Boyington, who Tatum apparently did not meet until years later. In 1959, Pappy married actress Delores "Dee" Tatum, who had been in four Hollywood productions in 1950-51. For some reason, To make sure the nuptials were legal in all 50 states, the couple wed multiple times, in Denver, Las Vegas, and Norfolk, CT. They were married until 1978 when Tatum married someone else. 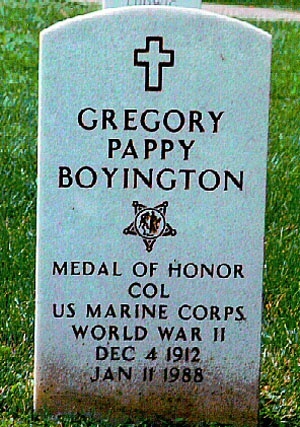 The thing about Pappy Boyington is that not only was he a war hero, but we can learn something important from his life. He was not some mythical figure, but a real person with faults and vulnerabilities. A man with minimal writing skills, he managed to complete both his autobiography and a novel that are absolutely readable and indeed distinguished by their sincerity and obvious personal embarrassment at his own foibles. By opening up, he damaged his personal reputation, as now everyone wrongfully qualifies his life achievements as being overshadowed by personal problems when that is the case with virtually everyone - none of us is perfect. My ancient, dog-eared copy of Pappy's autobiography, released in paperback while his television series was running. It's a great read. However, taking the broadest view, Pappy's candor staved off the onset of oblivion that surrounds so many colorless historical figures or those who don't survive the war (do you know who was the top US air ace of the war?). People remember Pappy as more than a newspaper clipping and victory total, and they feel his crises inside themselves. 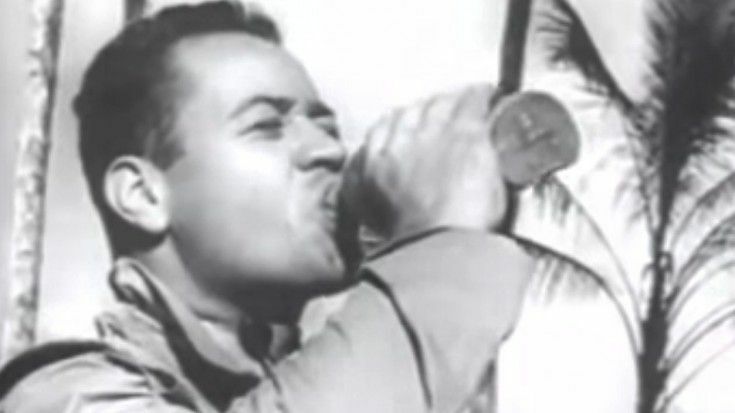 Anyone who surmounts his personal demons and manages to survive in the kind of situations facing Pappy Boyington is a hero regardless of how many planes he shot down.